LANSING, Mich. — Michigan school districts could use sinking fund revenues to purchase school buses under legislation introduced by Sen. Dale Zorn. A sinking fund is created by a school district through the levying of a tax millage on property in the district. Under current law, the sinking fund revenue may be used for security improvements, to acquire or upgrade technology, for the purchase of land for school buildings, and for the repair of those buildings and grounds. Senate Bill 384 would expand the use of a sinking fund to allow school districts to use it to purchase school buses. The bill clarifies that the sinking fund revenue could not be used for salary or benefits for school bus drivers or for the costs to service or maintain buses. “This is all about student safety,” Zorn said. “Thousands of Michigan students take the bus to and from school each day and use them to go on school outings or to a school sport’s game. Their safety on the bus should always be a top priority. Zorn said that there are approximately 5,000 school buses operating every school day in Michigan that are at least 10 years old, including four buses that are 22 years old. SB 384 has been referred to the Senate Finance Committee for consideration. LANSING, Mich. — Sen. Dale Zorn announced the passage of legislation to protect Michigan from chronic wasting disease and honor the memory of Rep. John Kivela. Chronic wasting disease (CWD) is a neurological disease found in deer, elk and moose. The disease attacks the brains of infected animals and produces small lesions that result in death. A deer can live with CWD for years and spread it through contact with other animals. “Chronic wasting disease is an issue that weighs heavy on the minds of sportsmen and women throughout Michigan and is especially important to the hunters in my district,” said Zorn, R-Ida. “I sponsored legislation in the Senate to guard against exposing our Michigan deer population to CWD brought in from out-of-state sources. 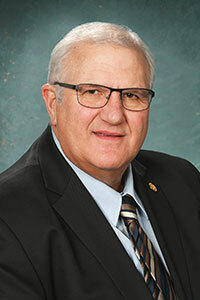 Representative Kivela also understood the impact of this disease on Michigan’s white-tailed deer population and sponsored legislation in the House to address the problem. Zorn sponsored Senate Bill 211, which would prohibit hunters from bringing certain parts of an animal carcass into Michigan from out of state and increase the penalties for violation of the law. Kivela, D-Marquette, sponsored House Bill 4424, which mirrors Zorn’s bill. The Senate passed HB 4424 on Tuesday in tribute to Kivela, who died earlier in the month. HB 4424 is specific in its scope and provides exemptions for certain carcass parts that do not pose a risk, including hides; deboned meat, quarters or other parts of the animal that do not have any part of the spinal column or head attached; finished taxidermy products; cleaned teeth; antlers; and antlers attached to a skullcap cleaned of brain and muscle tissue. A total of 24 states and two Canadian provinces have found CWD in both free-ranging and captive deer, elk and moose. In Michigan, a total of 11 captive and wild deer have tested positive for CWD since 2015. HB 4424 now heads to the governor for consideration. 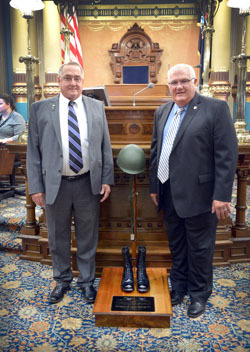 LANSING, Mich. — Sen. Dale Zorn, R-Ida, welcomed Vietnam veteran Dave Davison of Luna Pier to the state Capitol on Thursday as his special guest for the Michigan Senate’s 23rd Annual Memorial Day Service, which honored Michigan’s fallen soldiers. Davison served six years in the U.S. Army, including two years in Vietnam. He is currently the mayor of Luna Pier and the twin brother of Michael Davison, who was Zorn’s guest last year. Editor’s note: The above photograph of Zorn and Davison is available by clicking on the image or by visiting www.SenatorDaleZorn.com/Photowire. LANSING, Mich. — Gov. Rick Snyder on Tuesday signed Sen. Dale Zorn’s legislation to allow the use of corner flashing lights on emergency vehicles as an option to rotating or oscillating lights attached to the roof. Senate Bill 46, now Public Act 37 of 2017, eliminates the requirement that flashing, rotating or oscillating lights on emergency vehicles be mounted on the roof of the vehicles. Modern ambulance and rescue vehicles can have blind spots when rotating lights are attached to the roof. For decades, these vehicles have been using corner lights that meet the state’s visual requirements but their use has not been codified in state statute. The new law allows corner lights to be used on ambulance and rescue vehicles as long as the lights meet the requirements of being visible 500 feet away and from 360 degrees around the vehicle. Roof-mounted rotating lights may continue to be used as long as the requirements are met. LANSING, Mich. — Sen. Dale Zorn on Thursday welcomed Southern Michigan Center for Science and Industry (SMCSI) Program Manager Dan Rogers and Hudson Area Schools Superintendent Dr. Michael Osborne to the Capitol to highlight the SMCSI to an education subcommittee reviewing the Michigan Merit Curriculum. “As we look at the MMC to ensure that it is giving all our students an education that best meets their needs and prepares them for success, it is good to hear from leaders who are taking new and innovative approaches,” said Zorn, R-Ida. “The center is a wonderful example of area school officials and local business leaders coming together to give students a chance to learn the tools necessary to be successful and obtain a well-paying job in the critical areas of science, technology, engineering and math. SMCSI’s objective is to provide opportunities for careers in engineering, sales, manufacturing and advanced manufacturing and to improve student performance and workplace readiness. The center, housed in a former manufacturing facility in Hudson, provides 21st century education and training to high school students and adults through blended learning with the use of technology. LANSING, Mich. — Sen. Dale Zorn on Wednesday welcomed the Monroe County Bicentennial Alliance to the Capitol to celebrate the upcoming bicentennial of Monroe County. The alliance is composed of residents and organizations from across the county who are giving freely and generously of their time to facilitate a year-long celebration of the milestone. 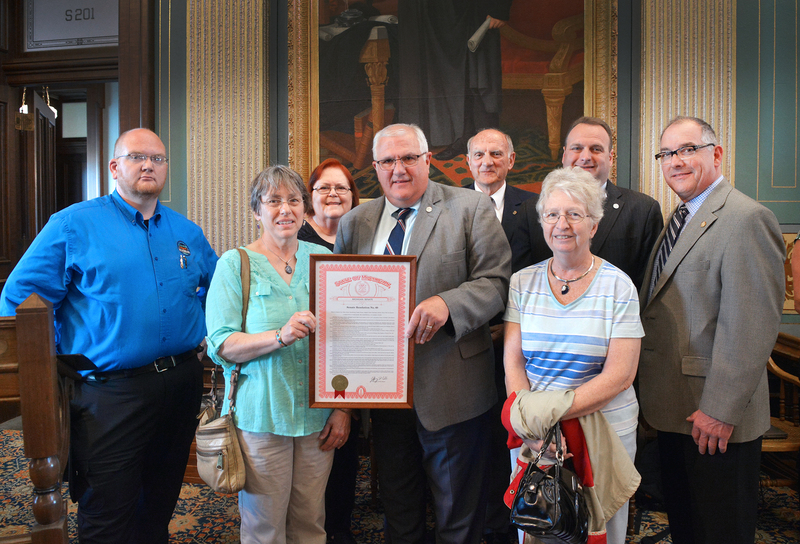 Zorn presented the group with a copy of Senate Resolution 60, which was adopted by the Senate in recognition of the county’s bicentennial. SR 60 says that the county of Monroe is Michigan’s second oldest county — created on July 14, 1817 in honor of President James Monroe, the nation’s fifth president. The resolution also states that the county was the first Michigan county to be divided into townships and gives details about each of the 14 townships and the city of Monroe. Editor’s note: The above photo is available by clicking on the image or by visiting www.SenatorDaleZorn.com/Photowire. LANSING, Mich. — The Michigan Senate has approved Sen. Dale Zorn’s legislation to protect Michigan’s deer herds from Chronic Wasting Disease by preventing bringing of whole deer, elk or moose carcasses into the state. Senate Bill 211 would create penalties for importing a carcass or parts of a carcass from a deer, elk or moose into Michigan. Offenders would face misdemeanor penalties of up to 90 days in jail, a $500 to $2,000 fine, or both. Hunters would still be able to bring in finished taxidermy, hides and antlers. In addition, deboned meat, quarters or other parts would be allowed as long as they do not have any part of the spinal column or head attached. For more information about CWD in Michigan, visit www.michigan.gov/cwd. LANSING, Mich. — Sen. Dale Zorn, R-Ida, on Tuesday presented a special tribute to Harry Hutchinson of Tecumseh in recognition of being named an IBEW Hour Power Apprentice of the Year. Three out of the last five years a Michigan apprentice has won this prestigious award. Hutchinson was the 2015 award winner. 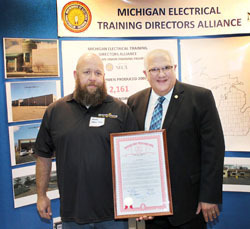 In addition to excelling in his apprenticeship class and on the job site, Hutchinson brought a passion for community work and charitable giving to International Brotherhood of Electrical Workers (IBEW) Local 252. He was the founder of the Union 4 Life charity, raising over $30,000 for breast cancer research at the University of Michigan Research Center. 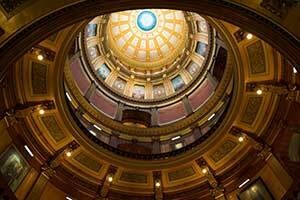 LANSING, Mich. — Sen. Dale Zorn was invited by Gov. Rick Snyder to hear an update from U.S. Health and Human Services (HHS) Secretary Tom Price on Tuesday regarding the progress at the federal level to combat the growing opioid addiction epidemic. Price said the federal government is providing $485 million in funding to support prevention, treatment and recovery services. The funding will be awarded based on rates of overdose deaths and unmet need for opioid addiction treatment. After the update, the Senate Health Policy Committee heard testimony on Zorn’s legislation to help prevent prescription drug abuse in Michigan. Senate Bill 47 would eliminate reporting exemptions for controlled substance samples, methadone treatment centers and buprenorphine prescribers. Zorn’s bill would require more reporting of controlled substances to the Michigan Automated Prescription System (MAPS), which is the prescription monitoring program for the state and tracks patients and prescribers for over-supply of Schedule 2 through Schedule 5 controlled substances. Two drugs that would be reported under the bill are methadone and buprenorphine. LANSING, Mich. — Teachers married to active duty military personnel stationed in Michigan would be able to immediately teach in the state under legislation sponsored by Sen. Dale Zorn and Rep. Joe Bellino. Senate Bill 365 and House Bill 4582 would create a new path for an active duty military spouse to gain temporary employment as a teacher in Michigan. • Shows proof the spouse is assigned to a duty station in Michigan with official active duty orders. The measures allow for annual one-year renewals, provided the requirements continue to be met. 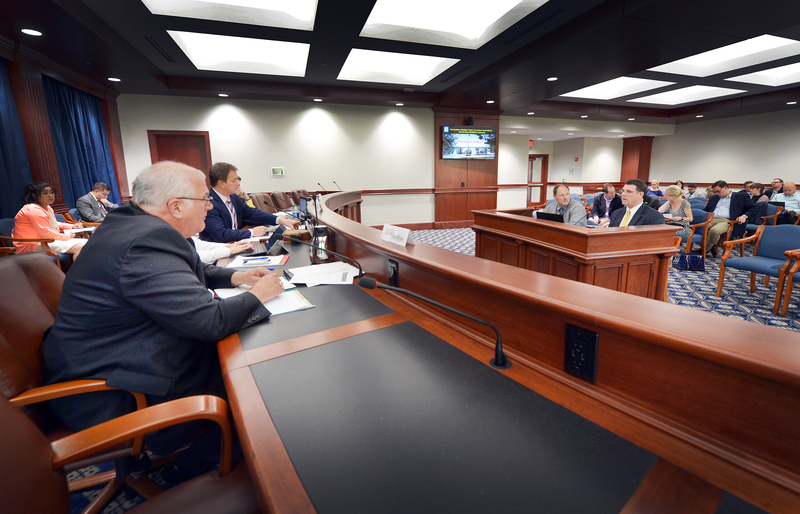 SB 365 has been referred to the Senate Education Committee, and HB 4582 has been referred to the House Military and Veterans Affairs Committee.